Our flooring fitters have been very busy in recent weeks, taking on variety of jobs, both domestic and commercial throughout the county. 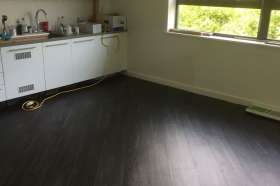 One such project saw us replacing the flooring of a family home in Long Stratton, updating three rooms and bringing a fresh new look to the house. Our customer wanted to replace the flooring on the ground floor of their home and required a floor that would be both practical and attractive in the hallway, kitchen and bathroom. We visited them at home with a number of samples so they could see the how the flooring would look against their décor in each room. 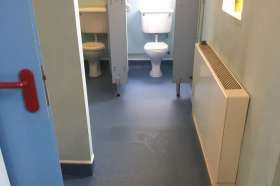 We advised on hardwearing and waterproof floor choices, with the customer choosing a neutral Camaro vinyl floor tile by Polyflor. With many colour combinations to choose from, the customer went for the Classic Yorkstone colourway with light grey grout throughout. Overall the area we were working on was fairly large but was split up in separate rooms with many obstacles to work around. The job wasn’t a hard one, but the number of kitchen units, door frames and bathroom units made the job a little more complex. The area we working with would be in constant use, which made choosing a durable floor covering very important. Vinyl floor tiles are very durable making them the perfect choice for the job and they are incredibly easy to maintain. Polyflor’s Camaro range comes with a ten-year residential guarantee, ensuring these tiles will be in good condition for years to come. We carried out our regular spot checks throughout the job, making sure that the flooring was installed to our high standards. It wasn’t one of our largest jobs by any means, but nonetheless it was an enjoyable one. Long Stratton is a pleasant little village and it was nice to tick another job off of our list. Interested in having new flooring laid in your home? We can help, give us a call on 01603 879359 or email us on sales@reformflooring.co.uk.